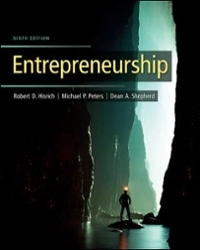 Entrepreneurship 9 Edition The 9th Edition of Entrepreneurship, by Robert Hisrich, Michael Peters and Dean Shepherd has been designed to clearly instruct students on the process of formulating, planning, and implementing a new venture. Students are exposed to detailed descriptions of ‘how to’ embark on a new venture in a logical manner. Comprehensive cases at the end of the text have been hand-picked by the authors to go hand-in-hand with chapter concepts.The superb author team of Hisrich, Peters, and Shepherd draw from their distinct backgrounds to create a book that addresses the dynamics of today’s entrepreneurial challenges. From Bob Hisrich’s expertise in global entrepreneurship to Mike Peter’s background as a both a real-life entrepreneur and academic to Dean Shepherd’s current research on cognition and entrepreneurial mindset, this book balances the crucial line between modern theory and practice.